Use Code: 30JVC32 to get this price. 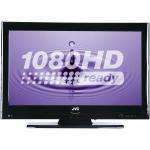 JVC 32" 1080p Full HD Ready LCD TV with digital tuner for Freeview channels and HDMI connection. I've always had a soft spot for JVC. Still got my 19 or 21 inch CRT in my bedroom and this would be a great replacement. I almost wish my old one - 18 years to be exact - would pack in so I could justify getting this.